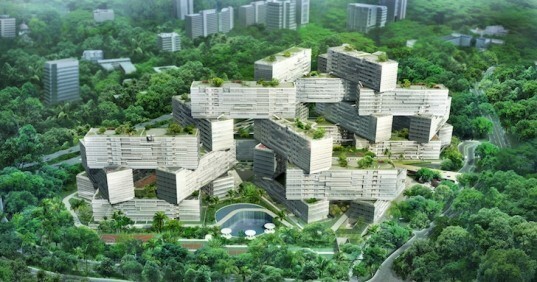 The Interlace - one of Singapore's most ambitious residential developments - is finally nearing completion. First unveiled in 2009 and designed by Ole Scheeren, former partner of OMA, the stacking, hexagonal arrangement of luxury apartments marks a radical shift towards a new architectural typology while maintaining Singaporean values. The massive 42-acre project, which promotes sustainability and the integration of environmental and communal spaces, is slated for completion in 2014. Surrounded by a 5.5-mile greenbelt, The Interlace interweaves elements of the environment into the complex with its many garden spaces. Eight open courtyards are anchored at the center of each hexagonal arrangement, creating a lush communal space that grows near each residential block. The thirty-one stacked blocks, each six-stories tall and identical in length, create a total 1,040 apartments. Interconnectivity, a key theme of Interlace, is explored through the flexibility of its stacked, dynamic form. The multiplicity of space creates opportunities to meet the needs of both privacy and shared living. Environmental studies, such as sun, wind and micro-climate analyses, were carefully conducted to inform sustainable building practices and include passive energy strategies into the site. With its dramatic external form, the Interlace stands out not only as a high-density residential destination, but also as a beacon of sustainable architecture. The careful orientation of each stacked block maximizes long-range views across the sweeping tropical parks surrounding the complex as well as views into each courtyard garden. Singapore’s culture is also represented within each communal green space, including elements such as a lotus pond, waterfall and rock garden. Interesting idea, but there is no caratterizzation of the blocks, or maybe it'not explained in this article. Surrounded by a 5.5-mile greenbelt, The Interface interweaves elements of the environment into the complex with its many garden spaces. Accessible garden spaces are situated over the rooftops. The thirty-one stacked blocks, each six-stories tall and identical in length, create a total 1,040 apartments. 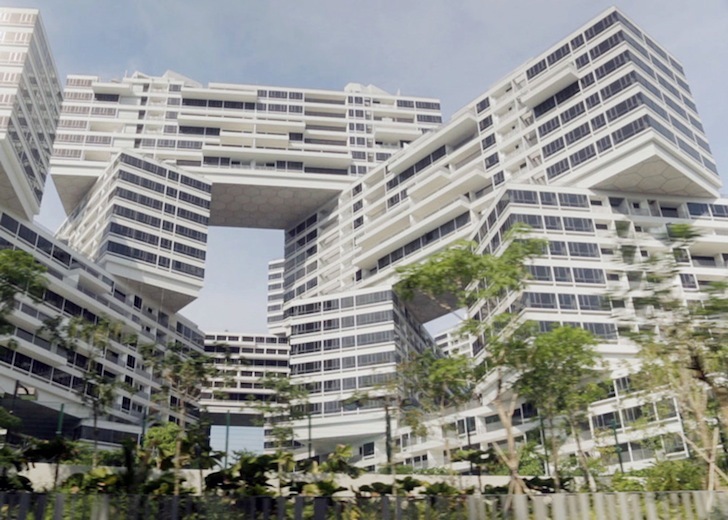 With its dramatic external form, the Interlace stands out not only as a high-density residential destination, but also as a beacon of new type of sustainable architecture. The careful orientation of each stacked block maximizes long-range views across the sweeping tropical parks surrounding the complex as well as views into each courtyard garden. Environmental studies, such as sun, wind and micro-climate analyses, were carefully conducted to inform sustainable building practices and include passive energy strategies into the site.